Wall continued to sing verses of the Jay-Z hit single as he filed through the layup line, enticing smiles out of his teammates. 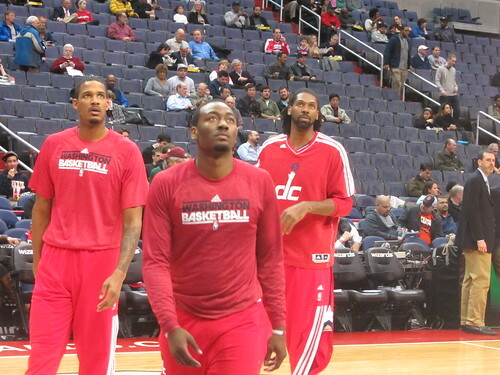 John Wall was back where he wanted to be, and the mood of the team was noticeably lifted. This was a different scene than that of the Nick Young/JaVale McGee/Andray Blatche era, where jacking around reigned supreme in warm-ups and a level of seriousness never materialized when it mattered. 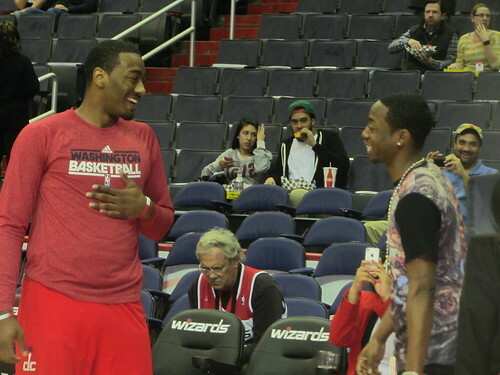 Wall was chatting up Bradley Beal non-stop and the rookie could not contain his laughter. The future franchise core tossed each other alley-oops—Wall struggled converting some dunks on his “jiggly legs.” Jan Vesely and Kevin Seraphin followed Wall’s lead with impressive slams of their own. Later during warmups, Wall started playing around with Kevin Seraphin on the left wing, shaking the big man with a crossover. Both cracked up. 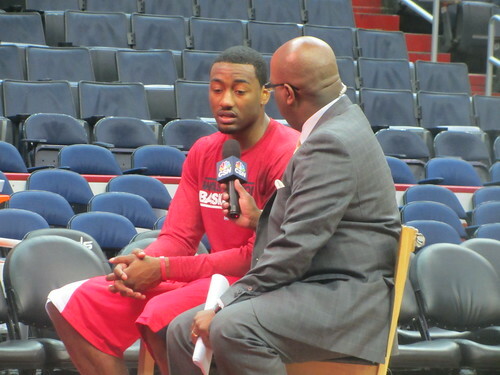 Wall mocked Seraphin’s inability to stay on his feet. Wall’s engaging personality is often hidden in the button-downed, risk-averse image he presents in media interviews. Spend any time around Wall and you see the happy-go-lucky attitude is real and genuine. He appears to know every elite basketball player and partakes in many pregame pleasantries with opponents. The Orlando game was no different, as he greeted Magic reserve guard Ish Smith at half court—both hail from North Carolina, and likely know each other from the hoop circuit in the Tar Heel state. As the national anthem approached, Wall’s roommate and best friend, Tyrone (Ty) Williams, came over for their pre-game conversation ritual. But for all Wall’s friendly banter, there are no jokes once the ball is tipped off and it is time to compete. I only mention these three Wall exchanges because they foreshadowed the play that put him back on the NBA radar in 2013. Smith was embarrassed. Fans erupted. And Seraphin, on this occasion, was not the victim, but the beneficiary, of Wall’s crossover and dish. A.J. Price reacted to the crowd-pleasing play by pushing every teammate on the bench, before nearly tackling Wall. “I think that I was more hype than he was about the crossover,” Price mused. “Definitely a spectacular move.” After the game, Price joked that Wall put Smith in a body bag. Ish Smith was talking some trash to [Wall], who crossed him over and came back with it. Ish lost his footing. It is tough to catch someone that is that quick and low to the ground, but he was able to get him. Wall will continue to rack up highlights, but this crossover move will always be memorable for it represents visual proof that Wall is healthy and ready to chase his goals of elite NBA stardom in his third season.